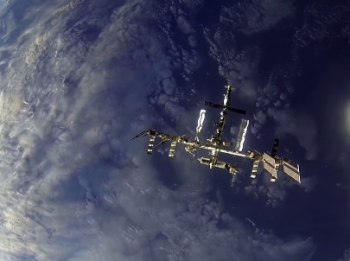 A Russian Progress resupply ship completed its six-hour trip to the International Space Station (ISS) on Thursday. Launched from the Baikonur Cosmodrome in Kazakhstan by a Soyuz-U rocket – on schedule at T-0 of 16:49 UTC – the Progress M-29M safely arrived with three tons of supplies for the orbital outpost. The latest Progress rode uphill on the Soyuz-U carrier rocket, with launch taking place from the PU-5 LC1 ‘Gagarinskiy Start’ (17P32-5) launch complex at the famous Cosmodrome. The Soyuz-U was developed as a standardized launch system, to replace the Voskhod and Soyuz and provide commonality with the Molniya-M. It first flew in May 1973, and in 1976 the original Soyuz, Soyuz-M and Voskhod were all retired, with subsequent launches of their payloads being conducted by Soyuz-U rockets. The Soyuz-U2 configuration, which was optimized to use synthetic propellant allowing it to carry more payload, was introduced in 1982, and used for around 90 launches before being retired in 1995. 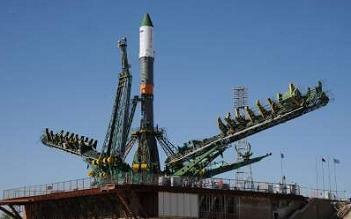 With around 750 flights, the Soyuz-U is the most-flown orbital launch system ever developed. It remains in service, and in the last few years it has mostly been used to launch Progress missions, as well as occasional military payloads. Once orbital insertion was achieved, the race to hook up with the ISS, in just six hours, required the first of two engine burns during the vehicle’s initial orbit of the Earth. With all going to plan, the second orbit required the help of ground controllers, with actual orbital parameters uplinked from a Russian Ground Site (RGS), allowing for a further eight rendezvous burns to be performed over the next five hours of flight. This fast rendezvous technique has been successfully employed on a number of Progress and Soyuz flights lately, although this mission marks the fast-track approach’s return. Progress M-28M and Soyuz TMA-18M both had to fly “standard” two-day profile due to constant ISS orbital changes that impacted on orbital phasing requirements. 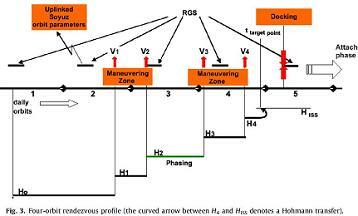 The previous six-hour approach was scheduled to take place with the Progress M-27M ship. However, the vehicle was doomed just minutes into its launch, as the Soyuz 2-1A rocket that lofted Progress suffered a major malfunction during third stage flight. Roscosmos confirmed the problem was with the third stage, which resulted in the launch profile entering the wrong orbital parameters, before a bad separation between the stage and the Progress resulted in the spacecraft spinning out of control. Progress M-27M – and its supplies – suffered from a destructive re-entry days later. Loaded with more than three tons of food, fuel and supplies for the Expedition 45 crew, the new Progress automatically linked up to the rear port of the Zvezda service module. It joins forces with a Station that is enjoying a busy period of operations. This week alone has seen the Station release one of its Visiting Vehicle spacecraft and dodged a piece of space debris. 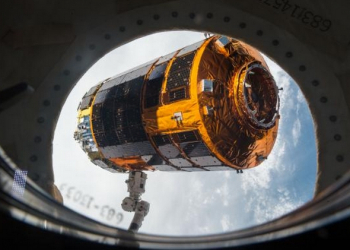 The departure of the Japanese HTV-5 occurred at the second attempt, following an issue with the Space Station Remote Manipulator System (SSRMS) that was grappling the spacecraft. “H-II Transfer Vehicle 5 (HTV-5) Release and Departure: The HTV-5 was successfully de-mated from Node 2 Nadir. However, during the first release attempt, HTV-5 release was aborted due to SSRMS Latching End Effector (LEE) B safing,” added L2 ISS Status. “The safing is believed to be due to LEE motor overspeed, which has been previously seen during capture operations. 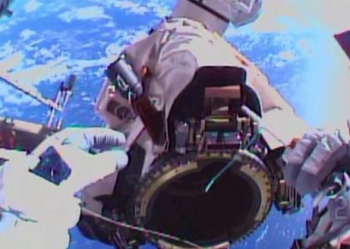 A second release attempt one orbit later was successful and HTV-5 has departed ISS. The arm was repositioned to allow for a survey of the LEE to check for any issues with hardware, comparing the visual observations with the photos taken of the LEE during EVA-30. “SSRMS Walkoff and LEE Survey: Ground teams completed the SSRMS walkoff to Mobile Base System (MBS) Power Data Grapple Fixture -1 (PDGF-1) and positioned the arm for the on-board crew to perform a survey of the Latching End Effector A (LEE-A) Snare Cables and Latches from the Cupola windows. The ISS Pre-Determined Debris Avoidance Maneuver (PDAM) involved two potential threats, resulting in the ISS killing two birds with one stone via the slight change to its altitude. “Ground controllers were following two conjunctions with a Time of Closest Approach (TCA) six hours apart. The first object was a Red threshold violation, and the decision was made to proceed with PDAM planning,” the L2 ISS Status report continued. (Images via NASA and L2).